Cinnamon Sugar 1.0 oz. packet – With a deliciously rich taste, and a surprising depth of flavor, real Korintje cinnamon is used and fused with all natural cane sugar producing a unique ingredient with beautiful color and texture. Perfect for baking, cooking, and adding to drinks and desserts. Clove Sugar, 1.0 oz packet – The aroma and taste of whole cloves are captured ideally in a sprinkle-able, sweet topping. Very versatile, this sugar is easily added to hot drinks, grilled meats, sauces, and spiced desserts. Vanilla Bean Sugar, 1.0 oz. 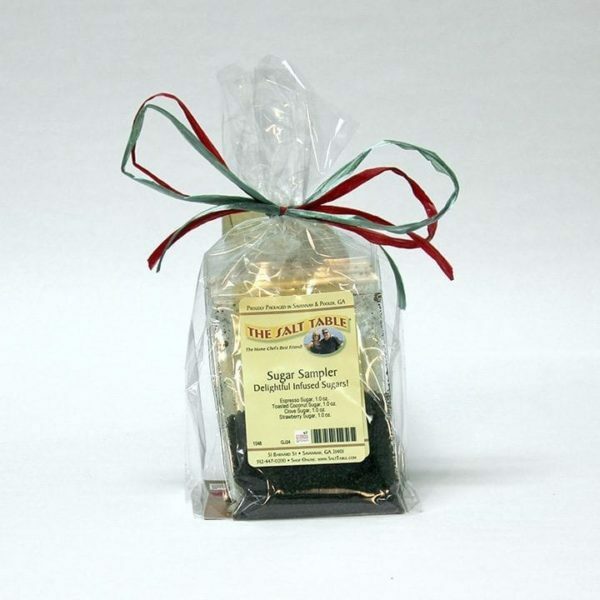 packet – Tahitian vanilla beans and real cane sugar are blended to create a sweet, rich flavor that is the perfect addition to hot tea, coffee, cookies and desserts, fruit and much more. Vanilla Bean sugar has a delicate texture and full flavor which make it a beautiful and easy addition to a wide-range of dishes and recipes. Espresso Sugar, 1.0 oz. packet – This is real espresso melded with the sweetness of cane sugar to create a unique and robust flavor. Top chocolate chip cookies, especially with bittersweet chips. Sprinkle espresso sugar over plain yogurt for a morning pick-me-up.Mix Espresso sugar with sea salt, use as a spice rub for steak before grilling.